Shrilanka, Dubai, Bhutan, Bali, Uzbekistan,Oman. Study tours are hands-on and experiential, combining theory with practice, and expose you to various cultural perspectives. You visit sites and experts in your field of interest that you may not otherwise access. During the Tour, recipients are immersed in architecture in every sense, from visits to global architectural firms to tours of renowned buildings. The tour is organised to gain as much access and exposure to the top architectural practices in the cities we are visiting and is definitely not your everyday tour experience. The students get an exclusive Look into the think tank of international practices.Past international tours have been to Shrilanka, Dubai, Bhutan, Bali, Uzbekistan,Oman. “City of Amritsar” addressing to the rich cultural heritage, lifestyle and inherent values within the city, including both cultural and natural resources, associated with a historical event, activity exhibiting other cultural or aesthetic Values”. The Religious Belief and Culture shapes the character of the city – a combined work of Folk, Culture and Place Making. Urban Character, Building Context, Street Experience, Building Expression, Building Access, Permeability, Vitality, Responsive Environments as key Principles of Urban Design to study Folk, Culture and Place associated with History over time: changing the course of Urban Form. Students of 3rd year explored earth-architecture and bamboo as a construction material in Auroville. Bamboo is a renewable and versatile non-timber resource that appears to be a promising material in building construction. Simultaneously, by meeting various experts on earth construction, students looked into the relevance of earth architecture in a historical context and tried to comprehend the important learning derived from the same. Students of 4th year explored the natural landscapes of Goa along with the historical Portuguese architecture. The students looked into colonial settlement to explore the local culture through architecture and cuisine. 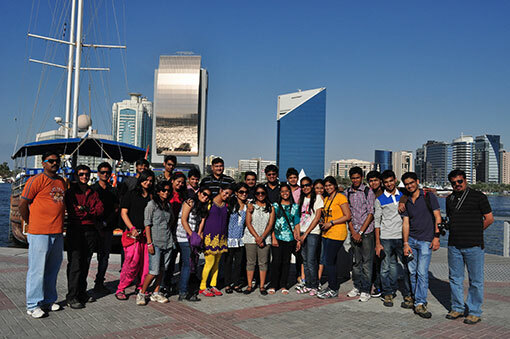 Students of 1st year experienced rock cut cave architecture and rock cut temple architecture at Ajanta and Ellora. The students also interacted with Ar. Ajay Kulkarni who talked about approach to design. Students also visited the Department of Architecture at MIT, Aurangabad. Students of 2nd year visited Delhi and Agra with the aim to familiarize themselves with Mughal architectural typologies of tombs, mausoleums ad mosque architecture. The study focused on analysis of scale, proportions and composition of architectural elements vis-à-vis the art of creating landscapes. Students explored the archaeological excavations at Mansar and also visited Kalidas Smarak, a famous cultural centre at Ramtek. They also had an insight into the temple architecture of Gadh mandir (a Jain temple) and Ram mandir.